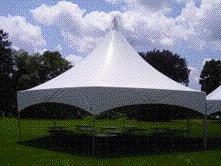 Hex tents are the newest fashion statement in the tent industry. No poles inside structure so lots of usable space. Attach different size Hex Tents together to make your event as unique as you are!